An example of the tandems available in Puglia. The make and style will depend on the region you are visiting. At Headwater, we like to take you off the beaten track, sourcing amazing hand-picked hotels in stunning locations; above this, we feel it’s also important to offer unique and exciting ways in which to do so, enhancing the experience even more. That’s why we’ve introduced some of our most popular holidays as tandem getaways so you can get closer to your partner as well as creating truly memorable moments that matter. We provide the tandem, you provide the laughter! 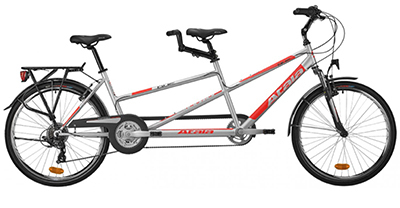 Riding a tandem allows cyclists with different abilities to stick together so you can both enjoy the surroundings rather than one of you constantly playing catch up. Tandems are addictive, as anyone who has tried them will testify, they're loved by couples, parents and friends who may otherwise be separated by a stetch of tarmac. Even when riders have the same ability it's sometimes difficult to really hear each other talk, that’s not going to happen here, no shouting necessary! The more experienced cyclist takes control at the front, taking care of the steering and managing the gear changes. Contrary to popular perception, the person on the back does have to pedal but as they don't need to worry about anything else this is perfect for less experienced cyclists. Having two people pedalling means you can tackle a hill easier than pedalling alone too. You bike will be fitted with panniers and the majority of our tandem holidays come with Ride With GPS technology too - so you won’t need any map reading skills. Ride With GPS is Headwater's routing mapping tool that provides simple but accurate navigation via a smartphone app. Turn by turn audio instructions means you don't need to stop to check the map - so there's more time to enjoy the cycling! For more information see our Ride With GPS page.